One shudders to go to BSNL office to pay bills due to long queues but life has changed courtesy internet as you can easily pay BSNL bill online without any hassle. Check the below procedure given with the screenshot. Below screen will pop up. 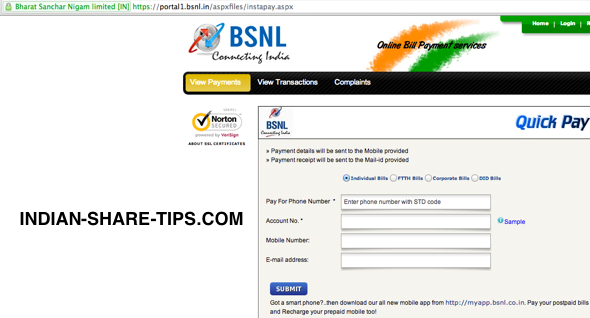 Lastly enter email id where receipt is to be received from BSNL. Next screen will show the name on whose name number is registered and amount bill. Thereafter you can select the mode of payment and balance is easy and it just takes 30 secs to make an online payment. On successful payment recording a receipt is generated and you can save the same for future reference and a confirmation email is received in email and sms in mobile number as a confirmation of the payment. Got a smart phone?..then download BSNL new mobile app from http://myapp.bsnl(DOT)co(DOT)in. Pay your postpaid bills and Recharge your prepaid mobile too!